You’re the best Kerry…. and I want to win! Facebook fan. Good luck, everyone! Who comes up with this stuff?!?! this card is ridiculously cute! I really want one. i hope i win this time!!!!!!!!! I love your FB updates! Hi there! I’m fairly new to couponing at Target. I’m glad I found your website, because I know it’s definitely going to help me when I do my shopping. Of course, a $25.00 gift card would really help me get a head start on getting some awesome deals. Thanks for this opportunity! This site is SO helpful…and tons of fun too! What a cute one – thanks!! Already love tt on fb!!! I “liked” your facebook page! Happy Holidays! I’d totally love to win this!! Thanks for so many neat giveaways! CUTE gift card! I would love to win!! Wow! I want to win this gift card. I “liked” FB awhile ago and have been saving more money now. TYVM! Boy I could sure use the extra funds right before Christmas. I hope you pick me! Love free giveaways – thank you! Cute giftcard, I love shopping at Target. You always have the coolest cards! I love Targets gift cards. This one is definitely neat. 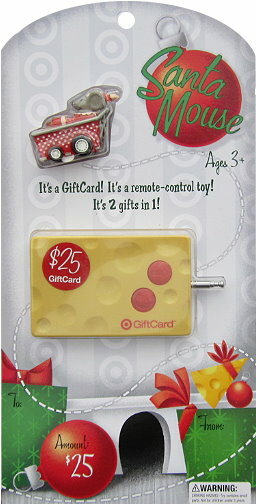 Cute remote control gift card! thanks. Can these gift cards get any cuter? Love it!